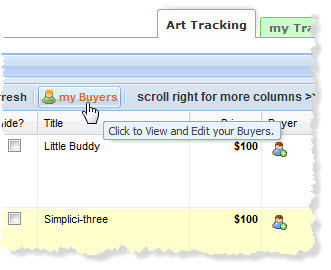 You can fully manage your buyers and assign them to artwork in your Art Tracking grid. You can view and edit all of your buyers by clicking the my Buyers button in your Art Tracking grid. Clicking the my Buyers button opens the Buyers window where you can edit and view your buyers' information, including the number of works of your art they have purchased the the total US dollar amount they have spent. You can click any buyer in the window to view and edit their detailed information, such as name, email address, mailing address, and more. 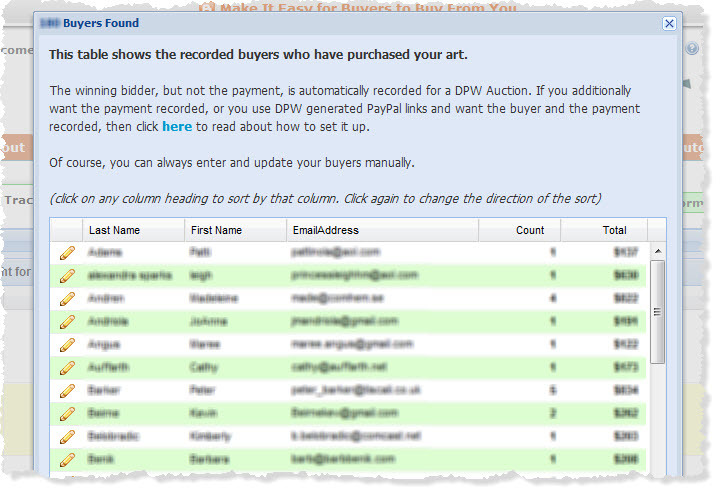 Click the add buyer icon in the buyer column of the Art Tracking grid to assign a new or an existing buyer to an artwork. Click the assigned buyer's name in the buyer column of the Art Tracking grid to view and edit the buyer, or even assign a different buyer. If you are assigning an existing buyer to an artwork, just start typing their last name in the Last Name field and select the correct buyer from the list of buyers that drops down. Note that only your buyers will be in the list. 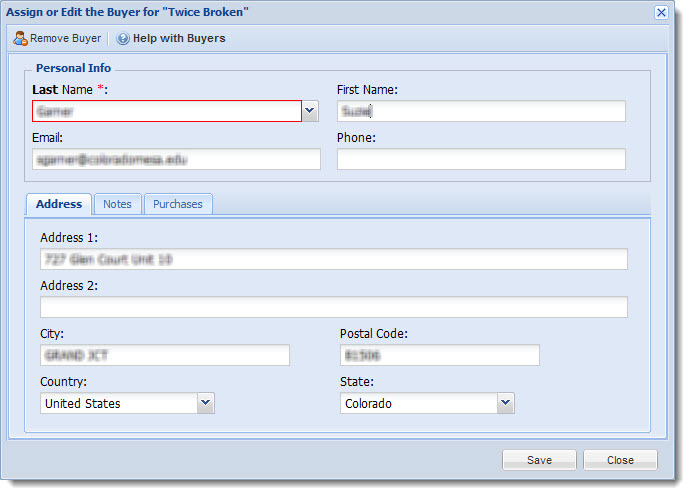 If you are adding or assigning a new buyer, then type their last name in the Last Name field and do not select any existing buyer's from the list that drops down. Open the window for an existing buyer and change their information as needed. To remove the buyer assigned to an artwork, click the Remove Buyer button at the top of the Buyer Window. This will only remove the buyer from that artwork and will not delete the buyer. To change from one assigned buyer to a painting to another, you must first remove the currently assigned buyer and then follow the instructions above to assign an existing or new buyer. Posted - Sun, Jul 22, 2012 at 6:36 PM. This article has been viewed 7293 times.